I've been struggling with writing about the money shell game Contractor A played with us -- it's hard to explain what was happening because sorting through the paperwork is absolutely monumental (we have about seven files boxes full of documents). In the meantime, let's take a nice, calming walk around the garden, why don't we? In the last week, the roses out front have started to go for their spring bloom. The plants I put in the pots -- drought-tolerant perennials because I know how dedicated I can be about regular watering -- are also showing off a bit. But I do need to divide the irises in the black pot there. 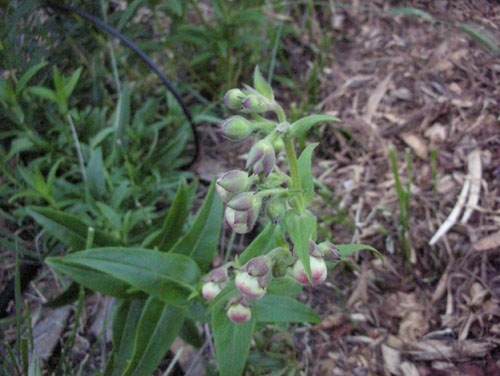 Around the side, my little penstemon enclave by the fence is doing nicely (this is P. hartwegii). I'm not sure what I was going for in planting a row of penstemons, but they look lovely and they enjoy the lack of regular water over there. I think eventually I will dig them up and move them forward more, put some taller plants along the fence itself as a backdrop. But for now there is no reason to move anybody anywhere. On the other side of the path, my alpine strawberries have settled in nicely. 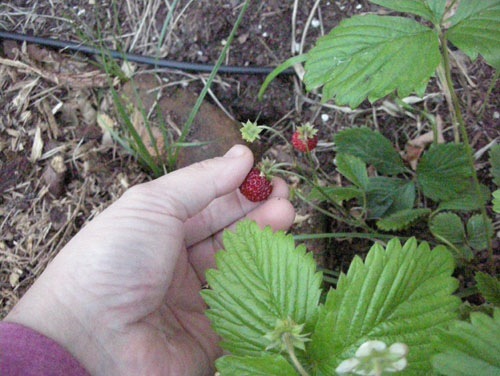 I didn't start nearly enough of them last year and should really put some more seed in soil this year to fill out the bed, but I wanted to see whether the two plants I have will spread at all, like my lower-altitude strawberries. 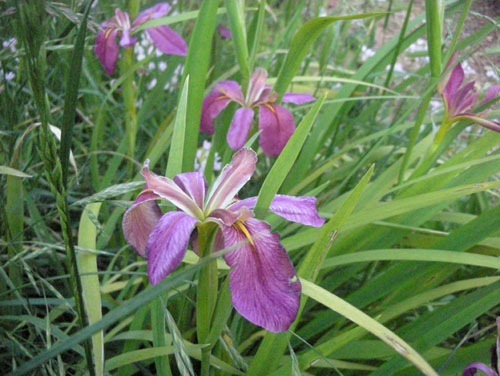 Speaking of spreading, Iris nelsonii is supposed to prefer boggy soil. Which does not explain why it is taking over my daylily bed; a very dry, sandy bed that is in a part of the yard that never has standing water. I do believe this will be a good candidate for divisions this year. Under the iris, among the daylilies, these weedy allium are growing. I love allium. They are a bit weedy, yes, but that means they'll put up with anything and keep coming back. They're pretty, they have interesting seed heads when the flowers fade, and I never, ever have to worry if I accidentally weed one out of a bed, because chances are there are forty other bulbs down there to take its place. 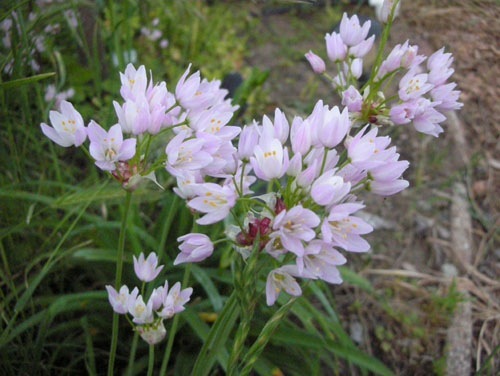 I've been spreading the allium love all over the garden in the last few years, and now you actually see it in the spring, little pink flowers everywhere (plus weedy grass, oxalis bells, and assorted other junk I'm not deliberately planting, of course). 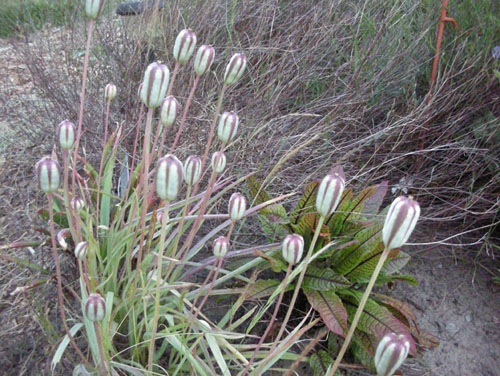 Across the pathway, the Lady Jane tulips have nice swollen seed heads. I'm a sucker for big roundish seed heads. I'll plant even ugly flowers for attractive seed heads, and Lady Jane tulips (T. clusiana 'Lady Jane') are by no means ugly. I have big plans for this bit of pathway in the coming week or two (the aforementioned tulips are up ahead on the right). 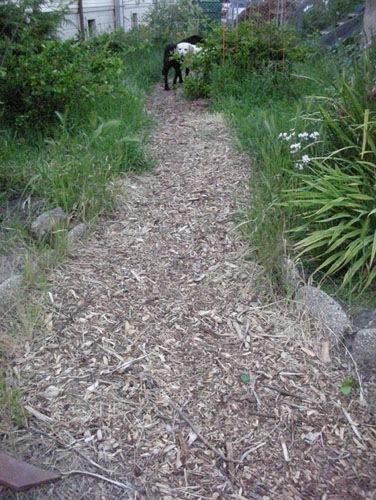 For too long, the path has been a bit too narrow to take a wheelbarrow down; I sized it like an interior hallway (it's only about 32-34 inches wide). So I'm going to widen it to four feet wide, and those Lady Janes are going to move, as are a bunch of other plants. 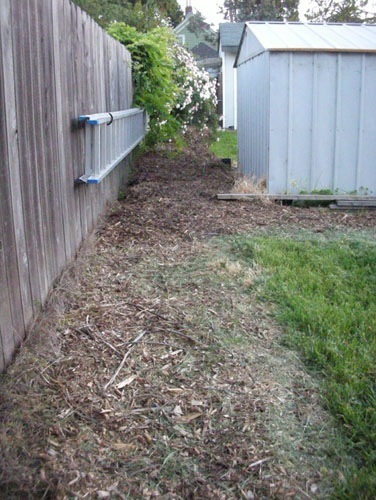 At the same time, I'm going to widen the path from the side yard into the back, because it also suffers from the same width issue. I'll start where there's a bit of hardscaping in the way; we plan to build our passiflora arbor in the coming weeks and that will take care of that thing that looks like an enormous shrub eating Goldie (it's actually a passiflora vine growing without supports). 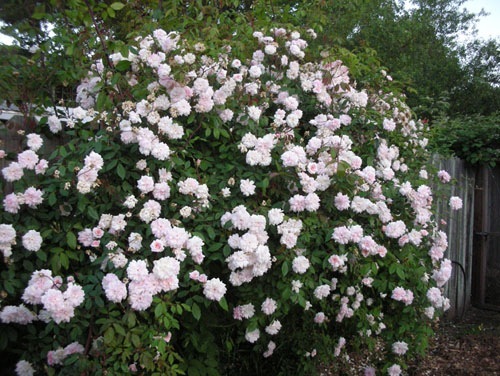 The other hardscape issue we have is the Cecile Brunner rose. I love this rose. Not only is it planted over my beloved kitty Mikey, but it bloomed for us even at the worst point of the foundation job. Cecile is always a beacon of hope for me. However, Cecile grows right over the pathway along the East fence. Eventually that shed will be replaced with a greenhouse (we hope to do that this summer, actually, now that we're not totally broke). 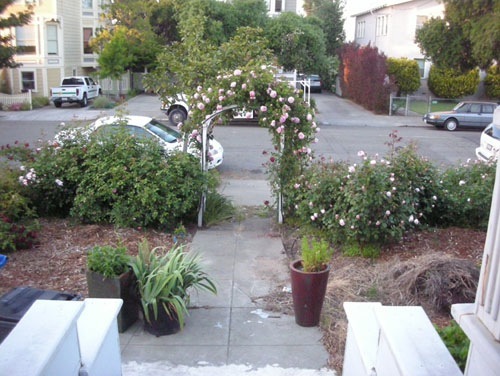 I'd like to be able to walk from the Fern Walk to the chicken yard without veering across the lawn or tangling with the rose, which means some kind of arbor. We're also thinking of talking to the owners on that side about replacing the shared fence -- their wisteria grows through the fence every year and is kind of tearing it apart, and the soil is higher on our side and has rotted the bottom, so it's on its last legs -- and when we replace it we'd like to do something a little more fancy with an arbor above it. 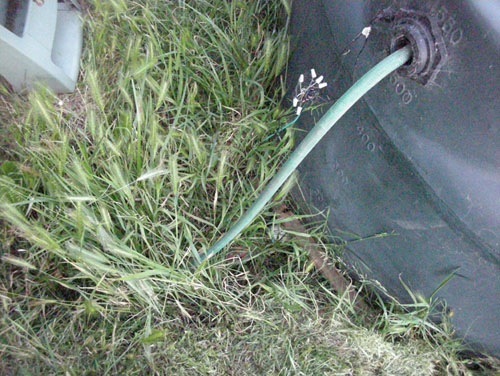 Speaking of daunting tasks, the hoses we've been using to connect to the tank are starting to show their age, and it's time for me to dig out a bit and actually plumb the tank correctly. Especially since we are going to be (and I canNOT believe this still) finishing that foundation permit and building a deck on the back of the house this summer. So, in other news, we chopped down a tree today. I know! 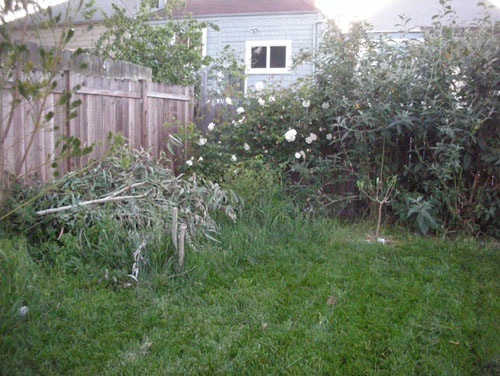 Four years ago our garden looked like a bombed out pit, and today a tree got so ugly we had to cut it down. You can see the branches in our brush pile (time to rent the shredder!) and the two stalks sticking out of the ground to the left of middle there. The tree had grown to about 20 feet tall and started bending over in half in a very unattractive way. But the ugliness was just the reason for cutting the tree down now, because lately I've gotten really into the idea of a brick bread oven, and that tree was right in the perfect spot for such an oven to be built. So it was going to be curtains for the eucalypt no matter how attractive it was. 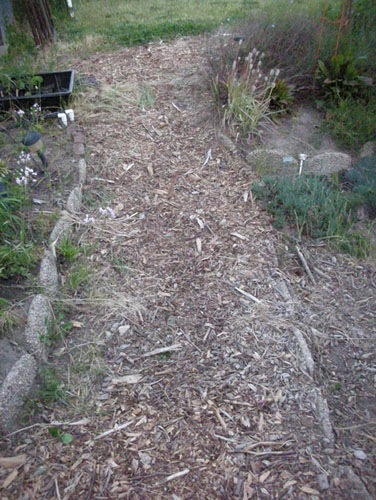 OK, enough about all the work we have planned, most of which involves hauling heavy stuff around the yard (can you see why we might want to widen that path, though?). 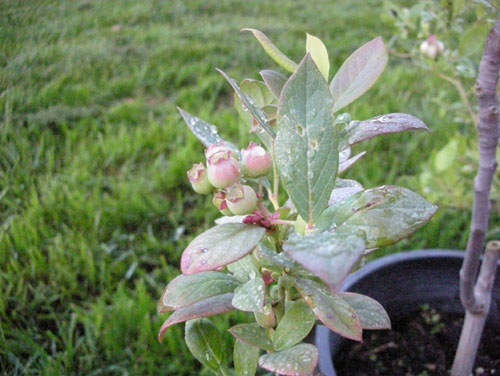 We have baby blueberries! Eeee! 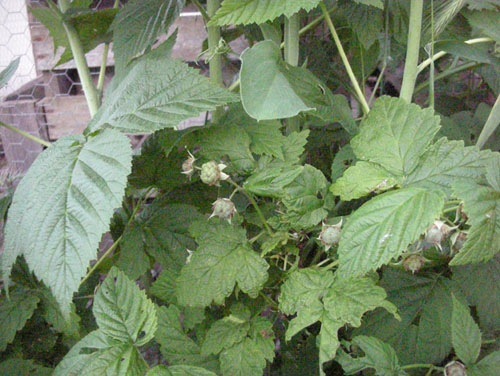 And baby raspberries! Noel ate the very first ripe one and pronounced it incredible. There really is nothing like a fresh raspberry. 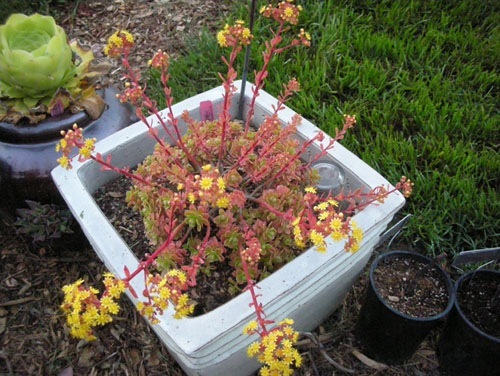 Right next to the blueberries, Aeonium spathulatum var. cruentum has been taking advantage of the wet weather to go a little crazy with the flowers. Weird little plant, isn't it? Tomorrow we have grand plans for getting started on some of our summer projects outdoors. Thanks for the garden report. I am with you on the raspberries. The Cecile Brunner is gorgeous and I hope you can come up with an amicable arrangement. Love the allium and Iris nelsonii too. It's funny about how some plants which are supposed vastly prefer certain conditions do just fine in others. For me, it's rosemary, which is supposed to hate the clay soil and wet roots, but really does pretty well. Go figure. I'm pretty sure the Cecile and I can work out a mutually beneficial situation. And I think there must be something more to a plant thriving in a particular place than just climate and soil. Maybe the bacteria in the soil, or angle of light... I've had some plants in supposedly ideal conditions just fail to thrive, while others that are clearly out of their natural element have been very happy indeed. Love the garden!! That rose on the arbor is just beautiful!